Widows of the Srebrenica massacre hope he will die in prison, while Bosnian Serbs have honoured Radovan Karadzic with a university dorm in his name. Ahead of his final verdict in a UN court, the former Bosnian Serb leader continues to divide the country he helped drive to war. On Wednesday a Hague-based tribunal will rule on whether to uphold the 40-year sentence Karadzic was handed in 2016. The 73-year-old was notably convicted of genocide for the mass killings in Srebrenica, in which more than 8,000 Muslim men and boys were slaughtered by Serb forces, as well as other atrocities including the siege of Sarajevo, in which more than 11,000 were killed. And yet among many Orthodox Serbs, who make up a third of Bosnia’s 3.5 million population, Karadzic is still celebrated as one of the “heroes” — alongside former Serb military leader Ratko Mladic — who they believe helped save their community during the inter-ethnic war. In Pale, a town east of Sarajevo that was Karadzic’s stronghold during the conflict, local authorities named a university dormitory after him just four days before his first conviction in the Hague. Many Serbs from Sarajevo settled in the bleak town during the war, which lies in the Republika Srpska, the semi-autonomous entity that emerged during the conflict. Though few were willing to speak, Janko Seslija, a 58-year-old veteran, captured a common feeling among Serbs that the UN trials are rigged against them. 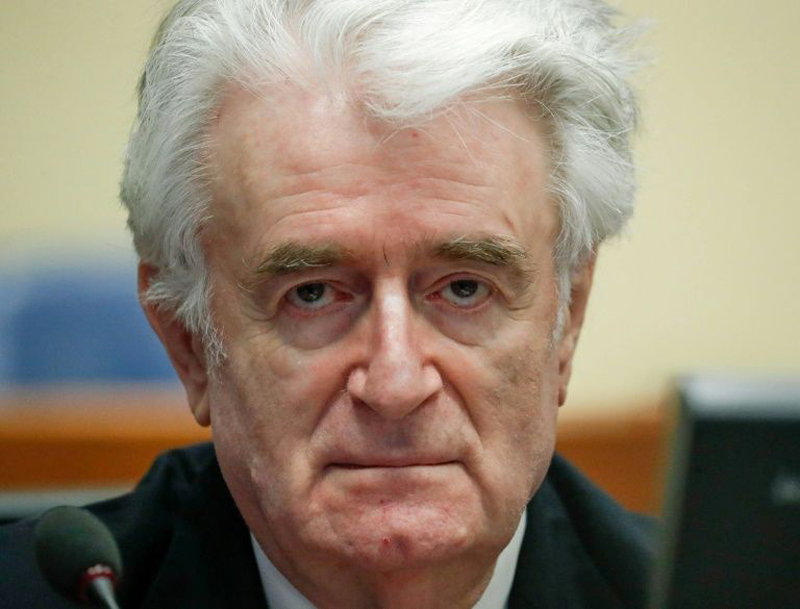 Karadzic’s verdict will be “dictated by the great powers”, he said. In 2016 Republika Srpska went as far as to decorate Karadzic in absentia for his “special merits”. The Serb entity also annulled a widely accepted 2004 report last year that detailed the scale of the Srebrenica killings. Now the government has formed a new international commission to investigate the atrocity and death toll, drawing condemnation from the West. For Nedzad Avdic, a rare survivor who escaped the executions in Srebrenica, the Hague’s verdict is essential to countering these attempts to rewrite the history that left his father and several uncles dead. “After (a guilty verdict), they will no longer be able to deny what happened here, deny that we had fathers, brothers, say that they were not executed,” Avdic told AFP. He recently protested at a presentation in Srebrenica by Dusan Pavlovic, who works for a Serb-run institute that commissioned the new investigation of the massacre. Pavlovic has written a book titled “The Battle for Srebrenica, a War for Civilisation” that he claims he is trying to “de-mystify” the massacre. He alleges that between 4,500 and 5,500 of those who died in the massacre were killed in combat with Serb forces, internal battles, by suicide or in minefields — an account that veers far from the well-documented evidence of how the men were taken prisoners and systematically executed over the course of several days. Pavlovic is not the only one pushing alternative histories. At the same event the Serb mayor of Srebrenica, Mladen Grujicic, said those killed in Srebrenica were victims of a “project by their political leaders to sacrifice the Bosnian people” to win support of the international community. For Avdic, the war on truth is now centre stage. “The verdict itself and the facts that will be established” are ultimately “more important” than Karadzic’s fate, he said. The UN verdict will draw the curtain on a prosecution that began 10 years ago when Karadzic, a onetime poet and psychiatrist, was found hiding in Belgrade in the guise of a self-styled healer. But time has not lead to any major reconciliation between the ethnic groups that clashed in Bosnia’s war. Muslims, Serbs and Croats continue to live mainly in their own enclaves and their leaders cling to power by stoking fear and entrenching divides. Momcilo Krajisnik, who was considered Karadzic’s “right-hand man” during the conflict and handed a 20-year sentence for war crimes, still defends his former leader. “I knew Radovan Karadzic and worked with him. I am sure he did not want war and that he is not responsible for the beginning of the war,” he told AFP. “That’s my opinion and that’s how Serbs think,” he added. But the memories of the war are still raw for widows like Bida and Vasva Smajlovic, whose husbands were among those killed in Srebrenica. “Nothing can ease the pain and fill the void,” Vasva, 75, told AFP during a recent visit to a memorial near the town. “But I feel that my soul will be a little relieved when I hear that he will not be freed,” she said of Karadzic. “We are alive, but we are dead too,” 66-year-old Bida Smajlovic says through tears, pointing to the rows of graves.